Light and shade loom large in architecture, as in life. In his book, In Praise of Shadows, Junichiro Tanizaki admires the traditional Japanese house, “the beauty of which depends on a variation of shadows, heavy shadows against light shadows — it has nothing else” (18). This subtle play of shadows delivers “a quality of mystery and depth superior to that of any wall painting or ornament” (21). Such engagement with light and dark inspires a richly experiential, human-centred, embodied and phenomenological approach to the design of spaces. Contrast that with a much harsher account of the complete and utter darkness of a universe stripped of light. “Black is without opposite: even light, which tries to turn it into its opposite, fails to do so when confronted with the rigour of its secret. Only the secret can see into the secret, like Black in Black” (405). “The Universe is deaf and blind, we can do nothing other than love it and assist it. Man is the being who assists the Universe” (403). These quotes are from a short piece of “philo-fiction” by philosopher François Laruelle called “Universe black in the human foundations of colour,” that gives expression to the idea of a universe without humans — a post human universe, post-extinction. He treats Black not as a colour but a cosmological constant or principle. Black is a substance of the Universe, separated from the all-too human imaging of light and dark. What kind of art or architecture does that sentiment inspire? 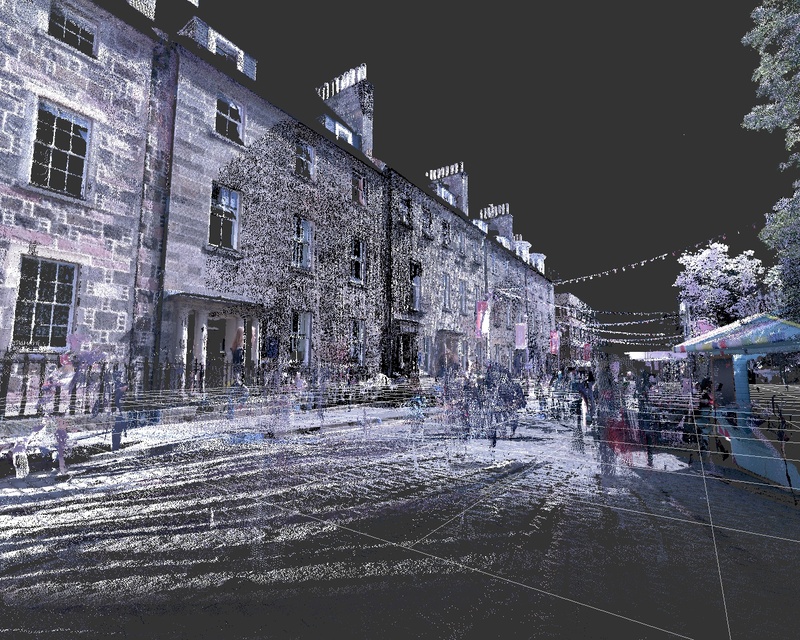 Such thoughts loomed over our thinking as we created a LiDAR scan of the street on the East side of George Square at the height of the Edinburgh Festival season. I accompanied Asad Khan, Nick Mols, and Mike Boyd. Mike from the uCreate unit in the University taught us how to operate the equipment, a tripod mounted Leica BLK360 that records distances from the scanner to any surface within range and within its view. We took readings from five different positions along the street. 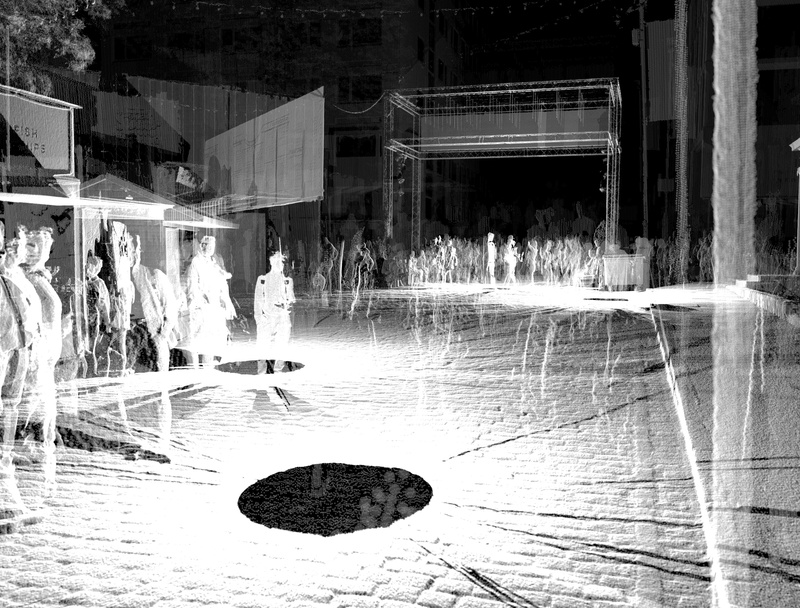 With a little guidance from the operator, specialist software aligns and adjusts the scans to produce a three dimensional impression of the street scape. How did this encounter speak to the black universe? 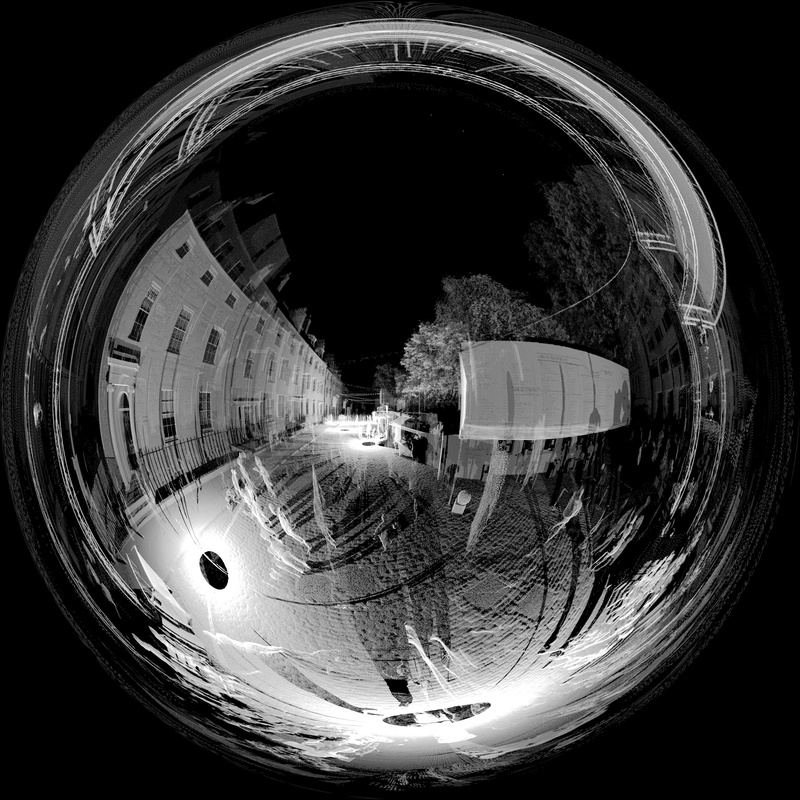 LiDAR surveys its environment with an invisible laser beam, reflected from a rapidly rotating mirror. The street was busy with Festival-goers, fast food concessions, and entertainers, unaware that they were being scanned, along with the buildings and street furniture. 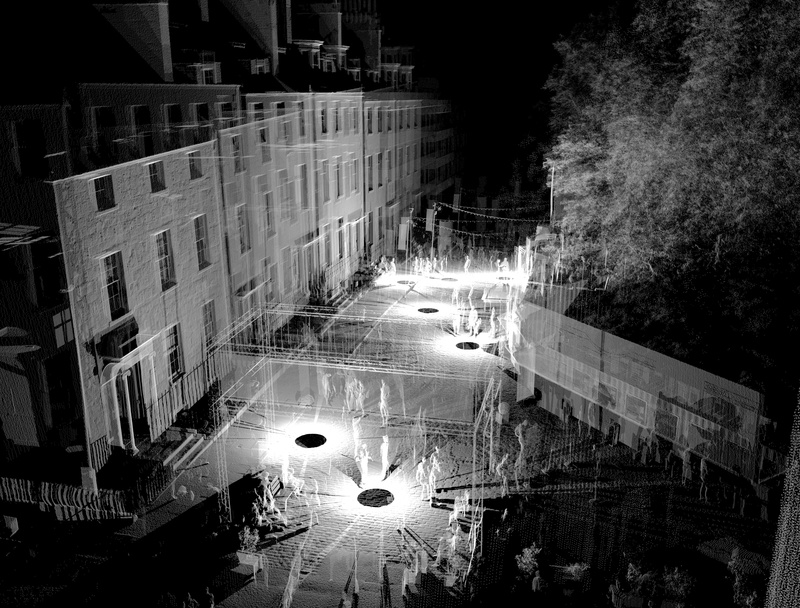 LiDAR is unlike photography or the human eye. It sends a beam of invisible light into the world. What it doesn’t encounter it returns as black. The world beyond the scanner’s range returns as inky black. 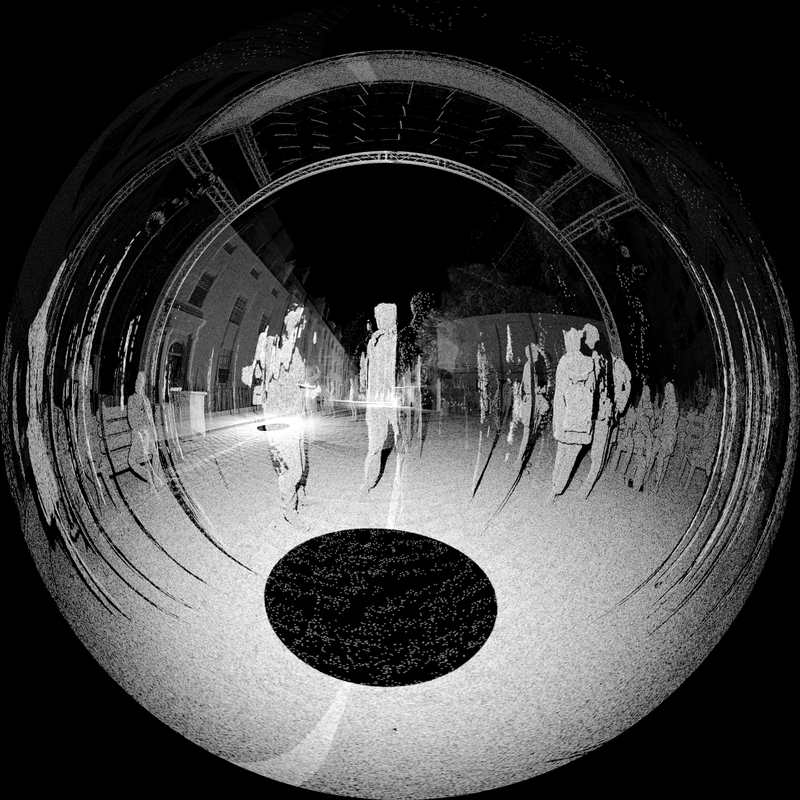 Human beings are noise in this scanned universe, as they move and blur. We can set the specialist software to obliterate points that don’t repeat in the succession of scans. 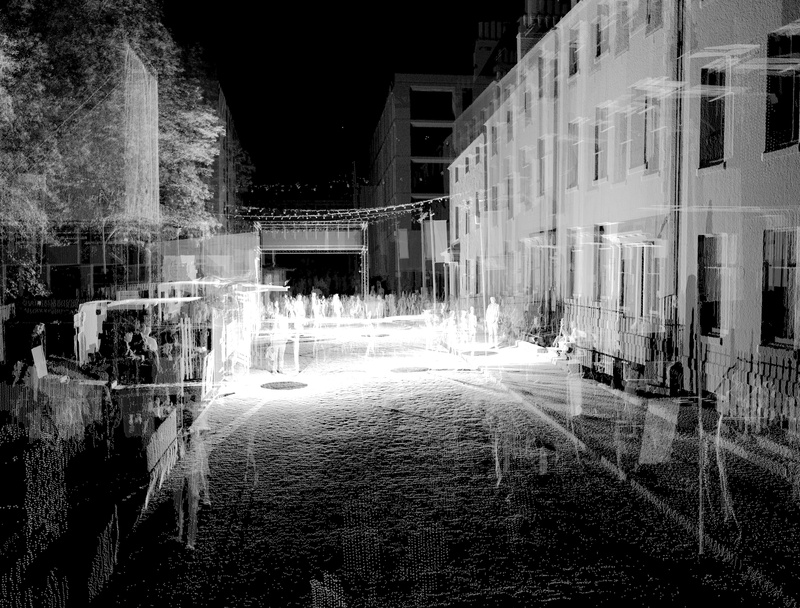 LiDAR obliterates the human, sometimes leaving remnants, shadows of human presence — ghostly reminders of (not yet) human extinction. Asad Khan produced the first 5 images below with ray tracing software treating each data point as a light source. The black discs on the ground plane are where we positioned the Leica BLK360 for each successive scan. The data from one of those scans is out of alignment, duplicating some of the surfaces. Mike Boyd produced the final image using standard visualisation software and with the rogue scan realigned. The people have not been removed from any of these images. Click to enlarge. Coyne, Richard, and Asad Khan. 2018. 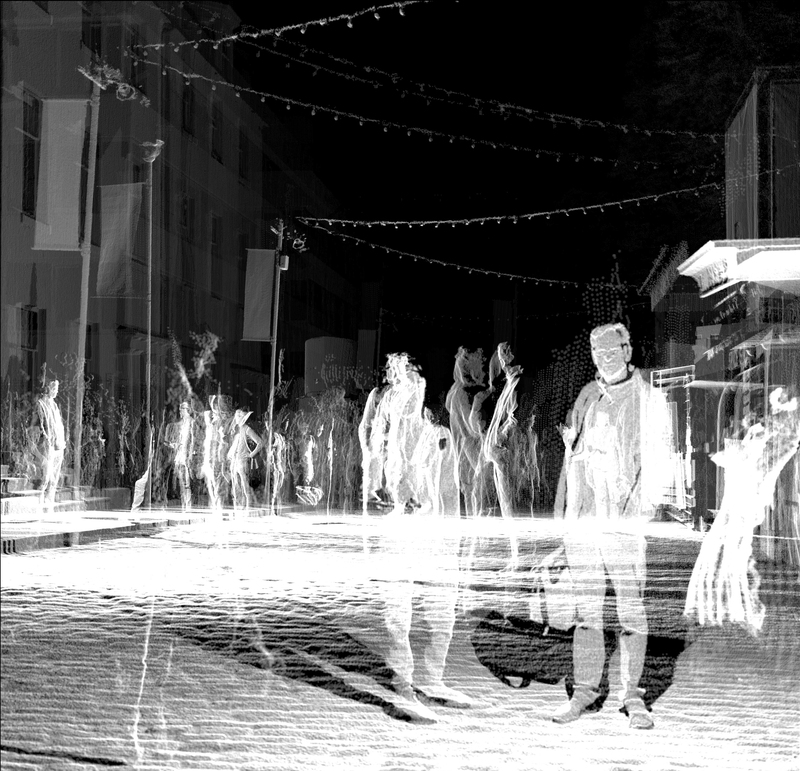 Fade to black: LiDAR in the age of extinction. Reflections on Technology, Media and Culture, 18 August. Available online: https://richardcoyne.com/2018/08/18/fade-to-black/ (accessed 18 August 2018). Brassier, Ray. 2003. Axiomatic heresy: The non-philosophy of François Laruelle. Radical Philosophy 121, 24-35. Laruelle, Françcois. 2010. The truth according to Hermes: Theorems on the secret and communication. Parrhesia, (9)18-22. Laruelle, Françcois. 2012. Universe black in the human foundations of colour (1988). In Robin MacKay (ed. ), From Decision to Heresy: Experiments in Non-Standard Thought: 401-408. Falmouth, England: Urbanomic. Laruelle, Françcois. 2012. From Decision to Heresy: Experiments in Non-Standard Thought. Falmouth, England: Urbanomic. Morelle, Louis. 2012. Speculative realism: After finitude, and beyond? In M. Austin, P. Ennis, and F. Gironi (eds. ), Speculations III: 241-272. Brooklyn, NY: Punctum Books. Tanizaki, Junichiro. 1977. In Praise of Shadows. Trans. Thomas J. Harper, and Edward G. Seidensticker. Stony Creek, CT: Leete’s Island Books. First published in Japanese in 1933. Also see posts: What ever happened to reality, Shadow of a doubt, Nomadology and colour, Four-fold reality, Signs in architecture and music.